A spine is composed of 24 bones known as vertebrae, which are connected and create a canal that guards the spinal cord. The seven vertebrae that start at the base of your skull to form the neck are known as the cervical spine. Cervical radiculopathy is also known as a pinched nerve, and it affects nerves in the neck that branch away from the cervical spine. The result is pain radiating into the shoulder and muscle weakness. It can be caused by degenerative changes (the result of aging) or an injury that produces a herniated disk. If you suffer cervical radiculopathy as a result of your job, the experienced Boston workers' compensation lawyers at Pulgini & Norton can help you pursue a claim with your employer's insurance carrier. Cervical nerves leave the cervical spine at seven levels and then supply muscles that serve the shoulders, arms, hands, and fingers so that they can move. They provide sensory fibers that give us sensation as well. Specific symptoms of cervical radiculopathy depend on which of the nerves is affected. However, in most cases, a conservative treatment including medication and physical therapy helps treat cervical radiculopathy. Repetitive stress from typing, lifting objects, or other repetitive motions can cause cervical radiculopathy. Usually, the symptoms involve shooting or burning pain in the back or neck. Sometimes, tingling sensations are felt in the hands or feet. Although the injury occurs in the cervical spine, the pain, numbness, or weakness that marks cervical radiculopathy may be felt elsewhere. 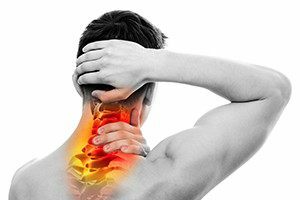 If you have suffered from symptoms of cervical radiculopathy caused by your job for five or more days and have been unable to work as a result, you probably are eligible for workers' compensation benefits. You should notify your employer, which is then required to submit an Employer's First Report of Injury or Fatality (Form 101) to the Department of Industrial Accidents (DIA), the insurer, and you. The Form 101 is supposed to be submitted seven calendar days (excluding holidays and Sundays) from the fifth full or partial day of your disability. Once your employer's insurer receives the Form 101, it has 14 calendar days to pay benefits or deny the claim on a Form 104. You should not mistake payments as a sign that the insurer has accepted liability for the cervical radiculopathy, however. The insurance company is allowed to pay the claim for up to 180 days after the initial injury without accepting liability. It can stop payments at any time during this period, which is known as a pay without prejudice period. If the insurer obtains your consent on a Form 105, it can extend that period for another 180 days. Although giving consent may seem harmless, it can have several drawbacks. You should consult with an attorney about your claim before giving consent. If you suffer cervical radiculopathy on the job, our Boston workers' compensation attorneys can help you pursue benefits from your employer's insurance carrier. Pulgini & Norton also represents injured employees in Braintree, Cambridge, and Waltham, among other Massachusetts cities. Contact us at 781-843-2200 or through our online form for a free consultation with a workplace accident attorney. Why Do I Need a Workers' Comp Attorney?